This dog came in for grooming and had a couple of ticks on him that needed to be removed. 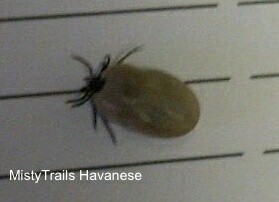 This tick is very large because it is full of blood that it sucked out of the dog. 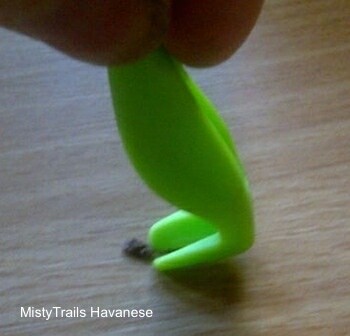 This is a very handy tick remover. When removing a tick you must get the head out. 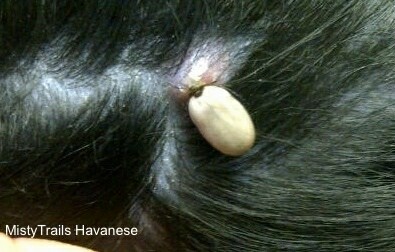 It is very easy to remove a tick leaving the head still attached to the host. 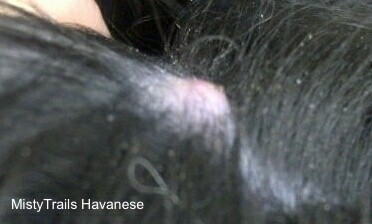 Once the body is detached from the head of the tick it is very hard to get the head out of the skin in which it is bitten into. It is best to use tweezers or tick removers as shown above. 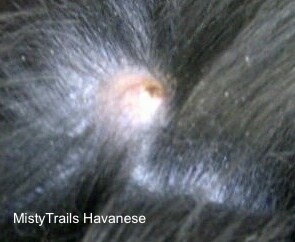 Be careful when using your fingers to remove ticks as it is very easy to leave the head behind. Tick sight a day after the tick was removed, it may take up to a week for the area to heal. If you see redness around the tick sight be sure you get the animal tested for Lyme disease and other tick-born ailments. If you live in an area where there are ticks it is best to get your pet tested for tick diseases on a regular basis.